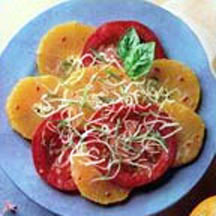 CooksRecipes has quality, kitchen-tested recipes for salads featuring tomatoes as a main ingredient. 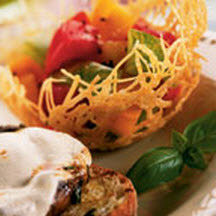 A colorful heirloom tomato salad dressed in a simple balsamic vinaigrette and delightfully presented in a crisp Parmesan "basket". A simple Italian-style salad of sliced tomatoes and oranges sprinkled with red wine vinaigrette, finely shredded mozzarella and a chiffonade of fresh basil leaves. 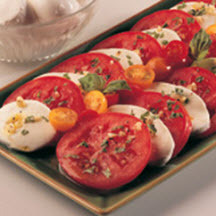 For a superb taste delight, use homegrown garden tomatoes or campari tomatoes, to make this classic Italian Caprese salad.